Sarah Brown's father is the well-known abolitionist John Brown, who is determined to end slavery in the mid-19th century. Her mother and sisters are sheltered from his work, but when Sarah learns she cannot bear children, she puts all she has into his movement, using her artistic talents to create maps to be used on the Underground Railroad. In modern times, Eden is a troubled woman who has just moved into an old home with her husband. Here she discovers a relic from the Civil War era hidden in a root cellar in her pantry. It has the potential to change her life. 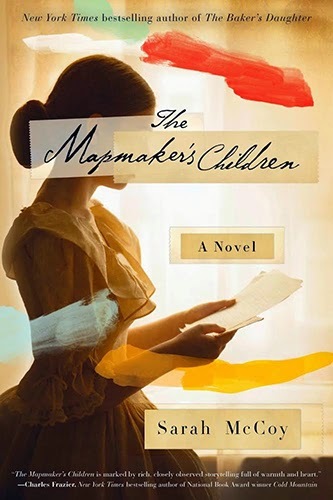 The Mapmaker's Children by Sarah McCoy is a wonderful blend of historical and contemporary fiction that alternates between the voices of Sarah in the 1800s and Eden in 2014. Through Sarah's story, we see the effects of John Brown's raid on Harper's Ferry and the horror of the Civil War. We get a view into the culture of the time and the way people came together to get through difficulties. I loved learning more about the Underground Railroad and this time in history. Eden's story brings the history forward into modern time. She and her husband are struggling with infertility and their relationship is suffering. When Eden finds an old doll head in the root cellar, she hopes it will help to get their home listed in the National Register of Historic Places so she can sell it and move on with her life. But a dog, a little girl and an amazing little community give Eden a nudge in a different direction. I found The Mapmaker's Children to be a heartwarming, quick read. I had a hard time putting it down since I kept wanting to read the next chapter in Eden or Sarah's story. I also longed to see how it all came together in the end. I was not disappointed. If you enjoy a mixture of historical and contemporary fiction, I highly recommend The Mapmaker's Children. This review was written based on a copy of The Mapmaker's Children that I received from TLC Book Tours in exchange for an honest review. This post includes Amazon Affiliate links. Wow! Sounds like a really great book. I don't know enough about the Underground Railroad. What an interesting setting! It really was a cool setting and I learned quite a bit.